New season equals new trends !! At times the switch between seasons takes a complete toll on a lot of fashionista's closet , And I have nothing to wear becomes a most heard word in every household ! It becomes tough at times for every woman to keep an updated wardrobe all though out the year.The answer is very simple and yes we all know it ! Shop your own closet. There is no greater joy than finding a new life in your well worn clothes ,just need to find a way to make the whole look fresh! Its never too late to save that dime n dough n create something new after a bit of reshuffling and there are many of the pieces in our closet screaming to be paired differently :) Getting dressed is truly a no-brainer ,proving the same to you by putting up this shopped from my closet outfit in less than 10 minutes !! In other words- Am ready for spring - Who else is with me ? BTW just entered this cool giveaway where I can win a Prada 27 Ns. Check it out here. You have worked the look well using pieces in your wardrobe:-) Especially liked the scarf and pallazo pants..Lovely!! Great look my dear! Love that maxi skirt and scarf:)! Thanks for invintation to follow each other I followed you here, LB, Blogloving! Hope you follow me back, nice day! Cool pants I want to find one but colored. Love the palazzos...n the scarf is so spring. I love those pants and i like the way you have styled them! totally love the red touch! In love with your scarf!! Look at your fluid pants and that great scarf ! Love your look ! Im ready too :)! !-New post on my blog urbanfashionstylee.blogspot.com !! you look beautiful! i love your outfit. that scarf, bag and your pants are gorgeous. also love the pretty backdrop behind you. i'm doing the same thing (shopping my closet). many things can pair with other things. Thanks for the comment. I'm following you now via Bloglovin. Waiting for you to follow back! Oh that scarf, that bracelet! So pretty! I guess something gone wrong and I can't see on my followers list. Maybe you try once again? very nice, love the tank! Te sigo en Bloglovin, ya que pronto se cerrará GFC y también en Tiwtter así podemos seguir en contacto. Lovely outfit and style ! I'm following you now . Im ready for sure :) With all the bright colors in store. cant wait. Just found your blog dear. Very nice outfit dear, love the foulard! 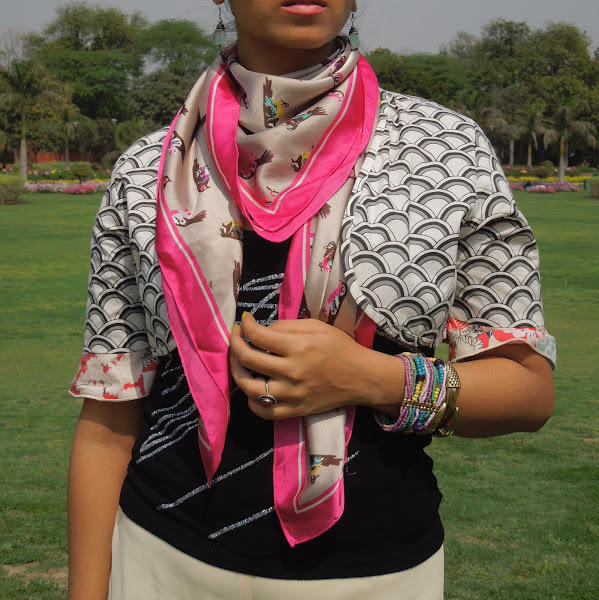 I love the mix of prints and the beautiful colors in the scarf. Check out our giveaway for a necklace made by Sima! You look great! I'm jealous of the weather! Kisses! I love you palazzo! I need one for this summer! My lovely fashionista, you look amazing. Seduce us with your style! I am in love with your scarf! It is absolutely gorgeous! Following you on FB to stay in touch! Love the scaled print bolero, it added a statement to the total look! Thanks for the nice comment on my blog sure we can follow each other let me know once you follow my blog will follow back yours. Sorry about the previous comment Surbhi it was meant for another blog.I am already following you lol. P.S. Great outfit you looking stunning as always. So pretty :) love it! I love the silk scarf! I can't believe you found it while thrifting!